FreEWI (pronounced free-wee) was designed as a free add-on for MidiBridge for EWI players, but can be used by anyone who needs to map MIDI events between apps. 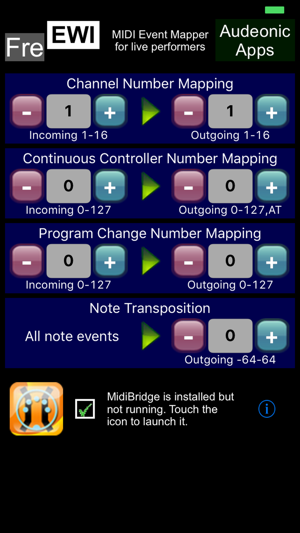 For mapping to/from external MIDI interfaces (or CoreMIDI network), MidiBridge is required. - Generating app must be able to write to FreEWI's virtual MIDI port. FreEWI supports fast switching to and from MidiBridge, so you can fast-switch/launch MidiBridge from FreEWI and vice-versa. 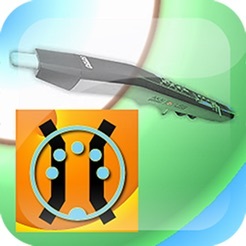 Other OMAC apps that support fast-switching will also be able to fast-switch to FreEWI. FreEWI does add a small amount of latency which varies depending upon the speed of the device and how busy the device is. Runs on iPad, iPhone and iPod Touch and requires iOS 5.1 or greater. FreEWI allows me to me to send virtual midi through my favorite apps which otherwise fail to communicate properly. While Midibridge is also an excellent solution with many more control features, I find FreEWI to be very capable, fast, automatic, and light on CPU resources. It's a great utility that provides an excellent solution to a common problem. Along with Midibridge, highly recommended. 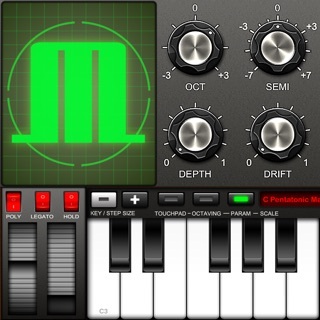 Though some midi synth apps support breath controller (midi cc 2) most of them don't, so of you want to try using your EWI with iPhone/iPad without re-configuring the horn all the time, this is a great way to go----and it's free. Thanks!